This is the first part of a 4-part instructional video series designed to get you acquainted with UpCity’s new Social Media Management tools, and show you the most useful, efficient, and downright cool functionality we have to offer. 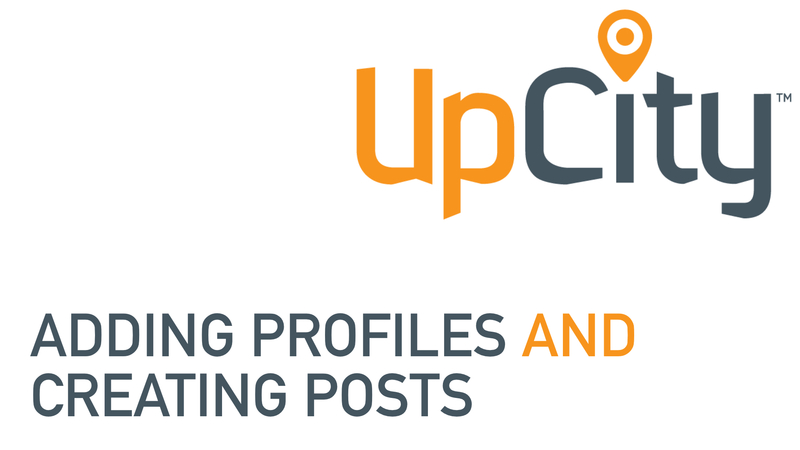 We’ve been hard at work integrating our new social media management functionality into the UpCity platform, and we are excited to finally share it with the world! Today we’ll be starting with the most basic features, including adding your existing accounts and profiles, and using the composition pane to generate high-quality posts with hyperlinks and rich media built-in. NOTE: We recommend logging in to all of the accounts you plan on connecting in UpCity prior to this process. This will ensure that you are connecting the correct profiles, and in most cases will allow you to complete the authentication process with nothing more than one or two clicks. You will see Add Profile buttons for each of the networks that are currently supported: Twitter, Facebook, LinkedIn, App.net, and Tumblr. NOTE: In order to add business or brand pages on Facebook or LinkedIn, you must first pair the personal profile that manages that business or brand page. Clicking one of these add profile options will direct you to the respective network to finish authenticating and grant UpCity access to retrieve profile info and post on your behalf. The new social functionality we’ve built in to the UpCity platform allows you to create and curate content from one unified interface that can be syndicated across multiple social media networks with the single click of a button. In this example video we used Send now to post our content immediately to the selected networks. In a later video, we’ll be introducing you to the queue, and we’ll show you how UpCity’s social engagement analysis can help to optimize your posting time and frequency based on when your audience is most engaged with your content.